I use heating pads almost every day. The have become a part of my nightly ritual before bed partly because I have sore muscles often and heat helps; but also because I tend to have bad circulation and I am frequently cold. It is not always convenient to use a popular type microwave heating pad especially when traveling, at work, or when doing errands outside. I found these heat treat warmers, and they are portable and easy! I really liked the heat treat warmers. They come in many different kinds to fit any need, or body part you might want warmed. There are ones made especially for feet, toes, hands, neck and even large “body” type. They are so easy to use. They come in individually wrapped plastic packs. You easily rip the pack open, and when the air hits it, the pad becomes very warm. 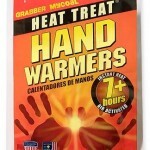 I also liked that there is no odor to them that usually comes with the rub-on type of heating muscle relaxant. They are also very lightweight, so I could take them or use them anywhere. I have even added one to my “waiting bag“. I especially liked the Adhesive body warmers. 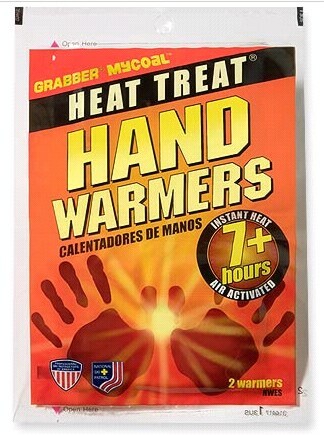 These are similar to heating products that I have seen that stick to your body. I like these better because they are made to stick to your clothing, not your skin. These pads might be an ideal solution for those people with sensitive skin who find those sticky kinds slightly abrasive. Overall, I would recommend these heat treat warmers to anyone. They are easy to use, so they are perfect for anyone young or old. The heat lasts a long time and helped with my sore joints and muscles. I also like the variety of styles to choose from. There is sure to be a heat treat warmer for whatever need you have! ANYONE KNOW WHERE I CAN BUY FINGERLESS GLOVES TO WEAR TO WORK SO I CAN TYPE ON MY KEYBOARD??? I have the little hand warmers to take with me but didn’t know they made different sizes. Thank you for the info. I use precribed patches that stick to my skin and not comfortable but does help. Not much I haven’t tried but the different size warmers and my Grandson is a big hunter and works on a two boat so I have to ask him to get me some larger ones. I have to agree and again stress the importance of looking at ALL things you are on/using when using a new product. Some of us are ‘lucky’ enough to get the perfect storm going, as in the previous post. I used to LIVE with heating pads on my back and neck. I also use Humira injections and pretty strong pain meds for my arthritis. I have APS as well, so my fatigue from that can be so strong I will feel like I can’t stay awake no matter what I do. Put those together…I fell asleep on the couch with a heating pad on my back, which I had done many times. I shifted somehow so that the heating pad was between my arm and my side. When I woke up, I had a HUGE blister on the side of my chest. Humira compromises your immune system, so I picked up a nice little staph infection to boot! I’ll have to check out these warmers! I’ve seen them around but never thought of using them for my pain. The idea of using them with the buff may be a winner because it is really hard to find a way to get heat/cold on the base of your skull without laying flat on your back. Great advice and reviews, everyone! I just wanted to add a bit of a warning here that I have put on my FB. I will include the original post and today’s update. BEWARE OF USING HEAT ON ANY PAIN PATCHES!!!! ORIGINAL POST – YESTERDAY: A dear friend of mine is on Fentanyl patches for pain after surgery. As a lot of people do, she applied the patch over the area of the pain. And also, because she had pain, she applied a heating pad. What’s scary is… the heat from the heating pad literally melted the medication and released ALL OF IT into her system at once. She also has 3rd degree burns from the heating pad, as the meds knocked her out and she never even realized what was happening! She had been alone for several hours while her husband was at work. When he returned he found her – totally unresponsive. She is still in the hospital in PCU and we are still awaiting word on whether or not she has any brain damage or permanent renal damage. I know a lot of you are on meds like this. PLEASE know… #1, you DO NOT have to apply these types of patches directly over the pain. #2, DO NOT EVER apply heat to one of these patches! #3, if you have to be on a med this strong, please try and make sure there is someone who can check in on you often! TODAY’S UPDATE: My friend is still in the PCU and we still aren’t sure whether or not she will have permanent brain damage. Her body was slowing down so much that her O2 sat rate was dangerously low. The doctors are saying today that the next 12 – 24 hours will tell a lot. She is still confused, combative and not able to speak intelligibly. Please continue to pray for her and for her family. The burns she sustained from the heating pad were looked at today by a plastic surgeon. He said that they would not look at doing surgery on her at this time… so that is a good thing, I hope. Another chest xray today did show some problems with her lungs. They aren’t sure exactly what it is yet, but are thinking she may have aspirated some vomit, so they’ll be watching it. We know that she will be in the hospital for at least another 3-4 days. As far as the renal failure, it is looking as though it was induced by the meds and they are hopeful that what they gave her through IV is correcting the problem. Everything is on a wait and watch basis right now. Thank you again for continued prayers. ***Please be very careful with pain patches, as well as with heating pads… ESPECIALLY if you are on meds that will make you sleepy! As always, thank you, Christine for your wonderful advice!!! I have been a dedicated user of these for several years now. I wear them around my neck and the back of my head primarily. What I do is: I have several tubes of knitted fabric, which I fold over several times. In one of the folds, I insert a couple of these heated warmers. They stay put where I need them the most, and they last 6-8 hours, esp. if you can keep them covered (that is, wear another scarf on top, or put on a hat or hoodie). Another trick is to “knead” them now and then, so that they do not form a solid rock like texture. Also, if you fold them together with each other and stick them in a pocket for 10 minutes you can sometimes extend the lifetime to 10 hours, using all these tricks. The nice thing about this method is that you neither have to stick them to your skin, hair or clothes. Just make sure you get the hand warmers (as pictured by Christine above), not the toes warmers, if you are planning to use my method. I have tried quite a few brands, including “re-usable ones” and these are the best for the money. When I started using them, I could get a pair for a dollar (CDN) but now they are up to $1.50 and that is if you buy them in packs of 10. I use at least 2 pairs a day, so I buy them in the hundreds, to get me through the summer! Even the Buffs alone are warm and comforting. I’ve seen those in the sporting goods stores. I know alot of hunters up where I live use them. I really should get some!! Just be very careful when using the ones that stick to ur clothes that their is no chance they can touch ur skin at any time as I had a inch over lap gap happen when wearing heat pad between my vest top and underwear and got a 3 degrees burn of about an inch on my tummy! Was in so much pain that day didn’t know I had got burned till later in the day. These are a wonderful invention! They are disposable and you can buy them in bulk although this is not a cheap option. When I’m feeling well enough I ride horses in the winter and use these to keep my hands warm while getting ready. Obviously this doesn’t take hours, so to avoid wasting the warmers, I put them into a ziploc bag when done. If you squeeze out all the air, you can get another use out of them later on!